With a small amount of yellow, black and white yarn, you can create an adorable amigurumi baby bee from Red Heart Yarn. Give as a gift, use to decorate a child's room, or let this cheerful bee keep you company at your desk. This is an easy pattern that anyone could make, and if you're new to the wonderful art of amigurumi, you're in for a treat! 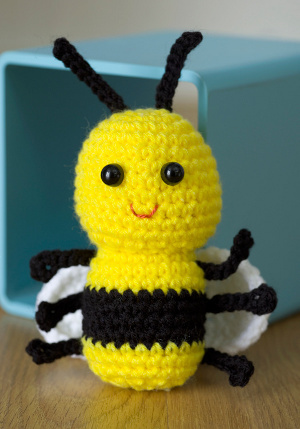 This little bee is sure to awaken your love for making fun and adorable crocheted toys for all your friends and family. Gauge: 16 sc = 4”; 20 rnds = 4” in sc. CHECK YOUR GAUGE. Use any size hook to obtain the gauge. Size: Bee measures 6” tall. Work in continuous rounds of sc without joining unless otherwise indicated. Place a marker in first stitch of round and move up each round. Begin at top of head with A, ch 2. Rnd 4: [Sc in next 2 sc, 2 sc in next sc] 6 times – 24 sc. Rnd 5: [Sc in next 3 sc, 2 sc in next sc] 6times – 30 sc. Rnds 6-12: Sc in each sc around. Rnd 13: [Dec] 15 times – 15 sc. Neck-Rnd 14: [Sc in next 3 sc, dec] 3 times – 12 sc. Body-Rnd 15: [Inc] 12 times – 24 sc. Rnds 16 and 17: Sc in each sc around. Cut A. Stuff Head. Rnds 18-21: With B, sc in each sc around. Cut B.
Rnds 22-24: With A, sc in each sc around. Rnd 25: Dec] 12 times – 12 sc. Rnd 26: [Dec] 6 times – 6 sc. Fasten off. Finish stuffing. Weave yarn tail through remaining 6 sc, draw up firmly to gather; fasten securely. Row 1: Sc in 2nd ch from hook and in next ch, hdc in next 2 ch, dc in next ch, 6 dc in last ch; working on opposite side of ch, dc in next ch, hdc in next 2 ch, sc in last 2 ch; turn. Row 2: Ch 1, sc in next 2 sts, hdc in next 2 sts, dc in next st, 2 dc in each of next 6 sts, hdc in next 2 sts, sc in last 2 sts; turn. Row 3: Ch 1, slip st in each st around. Fasten off. Sew in place on back of bee. With B, ch 7; 3 sc in 2nd ch from hook, slip st in last 5 ch. Fasten off. Sew in place. With B, ch 10; slip st in 2nd ch from hook and in each ch across. Fasten off. Hi Everyone! I love this cute little bee and have it all done except for the wings! I am having trouble understanding the directions; I don't understand the part about "working on opposite side of ch." It doesn't say to "turn" and work along the back, but it does say to turn later on. I have tried different things and I don't come out with the right number of stitches to work on and it just doesn't look right! I would really appreciate any help, I am so frustrated and would really like to finish this cute little guy and make more for my grandchildren. Thank you so very much, Happy New Year to all in 2013! I have a friend who just loves bees, not the real ones, just....shall we say artificial ones. I am planning on seeing her in August and will try to get one done for her. I will also make one for my granddaughter. This bee is just too cute. Having made many, many amigurumi animals I found this one to be adorable. Made the first bee for my great grandaughter age 8 and she loved it. Keep them coming. @kalicokids So glad you liked it! I think it's adorable, too! I have made many, many amigurumi animals and this is one of the cutest. My great grandaughter (age 8) was the first recipient of this one and she loved it. Keep them coming. Thank you for the bee pattern, I made one into a puppet for my daughter to take to music instead of the cardboard one she was using. Very cute and easy to do. Lindooo!!! adorable y lo veo super facil para tejer. Muchas gracias. Besos.